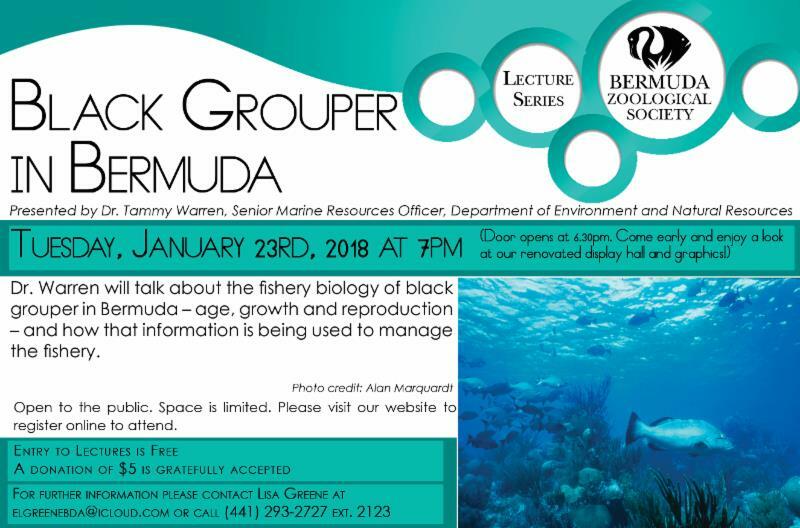 The Bermuda Zoological Society will be hosting a lecture event “Black Grouper in Bermuda”, presented by Dr. Tammy Warren, Senior Marine Resources Officer, Department of Environment and Natural Resources. The lecture will take place on Tuesday, January 23rd at 7.00pm with doors opening at 6:30pm. The event poster says, “Come early and enjoy a look at our renovated display hall and graphics. Dr. Warren will talk about the fishery biology of black grouper in Bermuda-age, growth and reproduction and how that information is being used to manage the fishery. For more information, contact Lisa Greene at elgreenebda@icloud.com or on 293-2727 [extension 2123].